Houston cracking down on aggressive panhandling, Chauncy Glover reports. HOUSTON, Texas (KTRK) -- Houston Mayor Sylvester Turner, along with more than 50 faith leaders, is raising awareness to address panhandling in Houston. The public awareness campaign, called Meaningful Change - Not Spare Change, is a community-led campaign that includes Coalition for the Homeless Leadership, Clear Channel Outdoor, iHeart Radio executives and management district leaders. "We are encouraging Houstonians to redirect their money from giving change on the streets to making a meaningful change to organizations who are working directly with the homeless," Turner said. 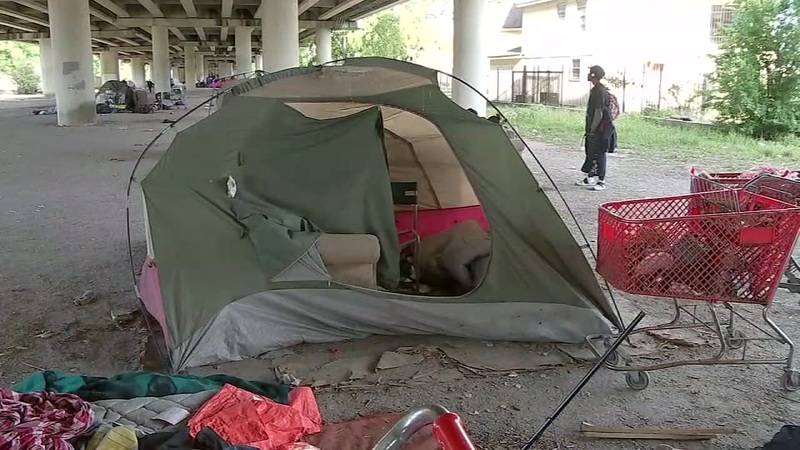 The Houston City Council approved an ordinance on April 12 to prohibit homeless camps and tents and panhandling on medians and sidewalks. Houston Mayor Sylvester Turner, along with more than 50 faith leaders, are raising awareness to address panhandling in Houston. "I am pleased that we are addressing this important public safety issue in our city. Panhandling in streets is dangerous to both panhandlers and motorists," city council member Mike Knox said. The homeless camp ordinance was enforced within 30 days of its passing, while the ban on panhandling on medians and sidewalks went into effect immediately. The bridge under Highway 288 and Cleburne also known as "tent city," is home to hundreds of homeless people. The city had already started to inform the homeless about the new ordinance. Councilman Dwight Boykins said three main areas they will target first are Highway 59 overpass, South Main and southwest Houston. The city passed the bans after numerous complaints about panhandlers and from neighbors near homeless camps. They say they are victims of crime or have experienced other issues that spill out of the camps. Knox applauded Mayor Sylvester Turner and other council members for what he said was taking a step towards making the city safer. A man did not want to be identified, but a panhandler who talked to Eyewitness News says he wouldn't be on the street asking for cash if his situation wasn't desperate. "If you had nothing to eat, what would you do?"